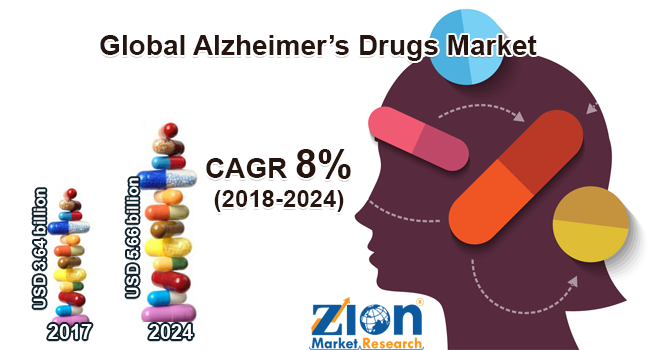 Zion Market Research has published a new report titled “Alzheimer’s Drugs Market by Drug Class (Cholinergic, Memantine, and Combined Drug) and by Distribution Channel (Hospital Pharmacy, Retail Pharmacy, and Online Sales): Global Industry Perspective, Comprehensive Analysis, and Forecast, 2017 - 2024”. According to the report, global Alzheimer’s Drugs Market was valued at approximately USD 3.64 billion in 2017 and is expected to generate revenue of around USD 5.66 billion by end of 2024, growing at a CAGR of around 8% between 2018 and 2024. Alzheimer’s is a neurodegenerative progressive disease. Alzheimer's disease is a type of dementia which includes a broad group of brain diseases, such as problems with memory, thinking, and behavior for the long term. It is a type of dementia and near about 60-70% of Alzheimer's disease is the cause of dementia. Many researchers consider an increase in the level of protein amyloid in the brain is one of the causes of Alzheimer disease. Older age is the prominent cause of Alzheimer's, whereas there are also some genetic and some other causes of Alzheimer diseases. The exact cause of Alzheimer’s disease is still unknown. The global Alzheimer’s market is mainly driven by the growing occurrence of diseases in developed countries specifically in the Western region. Additionally, the prevalence of some neurodegenerative diseases such as dementia, growing occurrence of diseases, firm government encouragement for Alzheimer’s drug development, and growing alertness about the treatment of Alzheimer’s disease is resulting into increased demand for Alzheimer’s drugs market. However, high prices of the advance drugs may create restraints in underdeveloped countries. Also, awareness about Alzheimer’s disease in the developing regions remains restricted, which has resulted in unbalanced healthcare systems and obstructive research infrastructure. In Asia Pacific region, growing encouragement for mental care by governments is anticipated to drive the Alzheimer’s drugs market in the near future. The Alzheimer’s drugs market is classified based on the drug class, distribution channel, and region. On the basis of drug class, market divided into memantine, cholinergic, and combined drug. Memantine drug segment anticipates leading the market in the forecast period. On the basis of the distribution channel, the market is divided into hospital pharmacy, retail pharmacy, and online sales. North America, Europe, Asia Pacific, Latin America, and Middle East & Africa are key regional segments of global Alzheimer’s drugs. North America is projected to lead the global Alzheimer’s drugs market in the coming future. Growing occurrence of disease in this region and many global players located in this region are creating a huge opportunity in this region. Europe also has huge potential for development, due to the growing geriatric population. Asia Pacific is also likely to develop at an extensively high rate, displaying a promising CAGR during the estimated period. Some of the key players in Alzheimer’s drugs are Ono Pharmaceutical, Johnson & Johnson, Daiichi Sankyo Company Limited, H Lundbeck A/S, and Eisai Co. Ltd., among others.